May 4 – It’s another road day. A day when our only goal is to cover as many miles of America as we can on our way to where we want to go: Denver, Colorado. Twelve hours in the car, and we’re hoping to get seven or eight of them done today, minimum six, which would put us in Green River, Utah, for the night. First stop is Jiffy Lube out on East Sahara Avenue – Dexy needs an oil change – and an air filter and an engine filter too, it turns out. While Dexy gets lubed up for the road, Bridget and I get lubed up on their free coffee. Michael, the store manager, gets Dexy in and out of there before I can get to my third cup. There are two of them in the shop this morning – Thomas, who’s working behind the desk and therefore is in charge of taking my money, and Michael – buddies with a sense of humor, and before long, Bridget and I are telling them the Reader’s Digest version of our road trip and pretty soon, we’re all handing out business cards and we’re off. It was good to see two guys who like their jobs – there are so many people out there who don’t. As we rush by the scenery (which mostly consists of dirt and tumbleweeds in the making) on our quest to count off the miles, there’s no time to stop for anything but the road warrior’s necessities: gas, coffee, food and the requisite pee breaks; photo ops are out of the question, unless we’re stopping to refuel our bodies or the car. 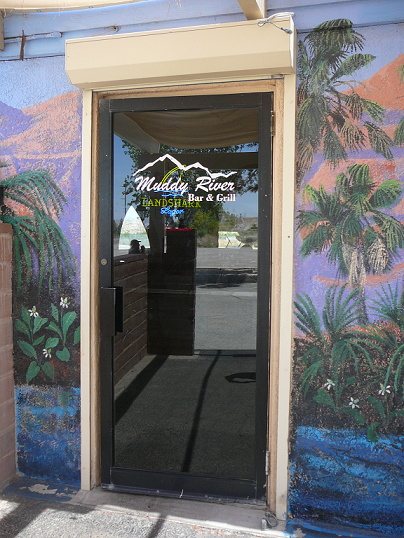 Here’s our first stop: Muddy River Bar & Grill in Moapa, Nevada – it’s lunchtime. Multitasking: food, pee break, photo op. 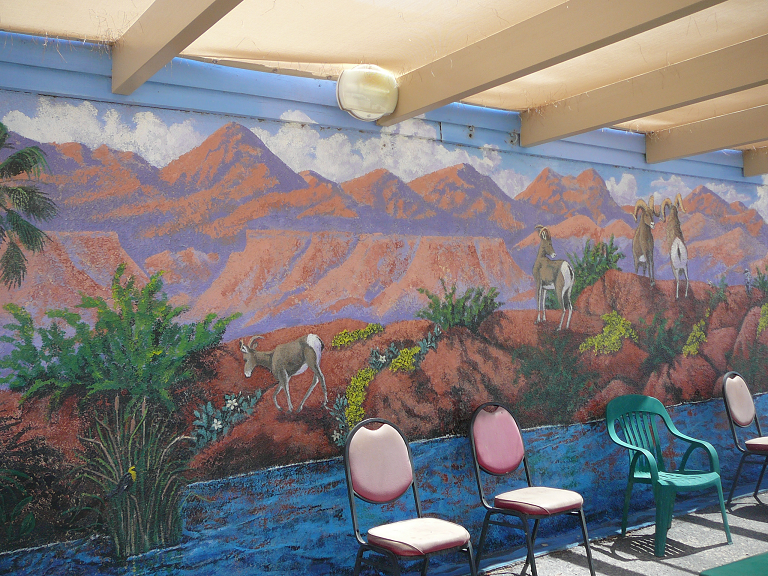 The mural surrounding the door extends the length of the front wall. Somewhere, Southwest, USA. Definitely not Moapa, out here in the middle of the desert. They do get some water here. 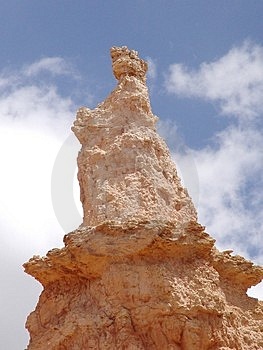 There are a couple of washes that empty into Moapa Valley. A wash (the Spanish arroya) is a dried-up creek bed that will fill up with water and flow during the rainy season, although with an average rainfall of 5 inches a year, I don’t think they have a rainy season here. I would think that in Moapa, the best they could hope for, in terms of flowing washes, would be a particularly heavy rainfall. This is vast, open territory, a place to go to to get lost in, if you get yourself off the highway. 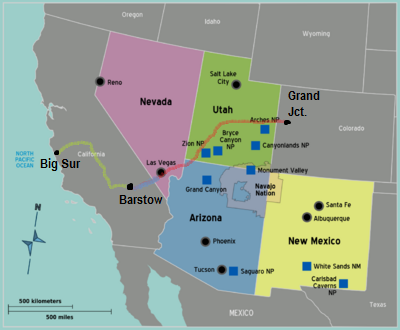 Here in Moapa, we’re northwest of the Grand Canyon, on Hwy 15, which sluices through the canyons and mountains of the southwest. We picked up 15 in Barstow, California, three days ago, and so far, heading in a northeasterly direction, what we’ve missed by sticking to the highway is Death Valley National Park out the driver’s side about a hundred miles away and the Grand Canyon out the passenger side, that too about 100 miles in the other direction. But we don’t miss Vegas. To the east of Las Vegas, about halfway to the Grand Canyon as the crow flies, is the very grand Lake Mead, where you’ll find Hoover Dam on its southern edge. I could probably skip the Hoover Dam, but the next time I’m in these parts, I’d like to explore the part of the Old Spanish Trail that runs along the western side of the lake. Originating in Santa Fe, New Mexico, the Spanish Trail was the New Mexicans’ trade route to Los Angeles, California. Nowadays, it cuts through six states to get to the ocean. In the days of mules, it was the way to go, but in the days of cars, Hwy 15 is the ticket. 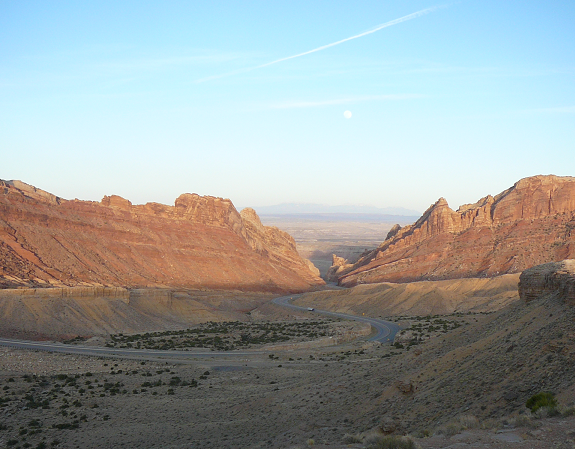 … turning east on I-70, we knock off the miles across Utah, with just one stop and more multitasking: enjoy a vista view of Spotted Wolf Canyon and take advantage of the port-a-potty. The view is remarkable. For years the narrow canyon was virtually impassable, but in 1967 in a monster engineering feat, they widened the canyon walls and ran the highway through it. 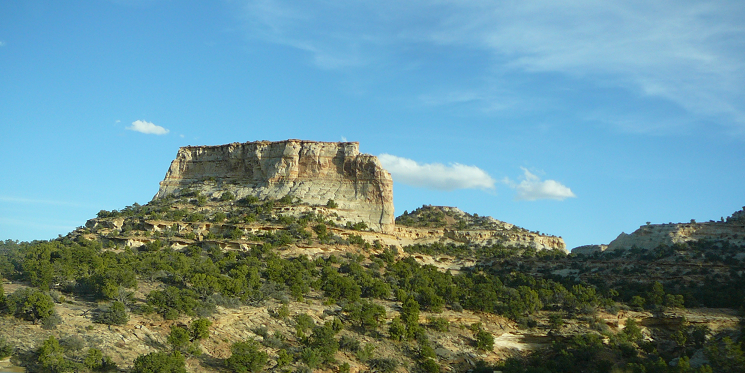 Through the twists and turns of the canyon and out the other side, we’re in Green River by dinnertime but in a fit of enthusiasm decide to push on for another 90 miles to Fruita, just over the Colorado border. When we get to the Super 8 in Fruita, we’re told there’s no room at the inn, but the customer-service-oriented guy at the desk phoned ahead to the Super 8 in Grand Junction 13 miles down the road. Success! We made our way to Grand Junction and called it a night, glad to get off the road.